Alexandria Post-War Suburbs Historic District: Compliments to those who made it happen! 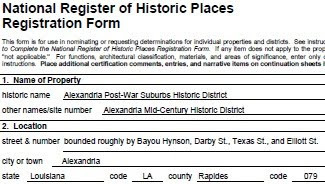 Now that the Alexandria Post-War Suburbs Historic District is listed on the National Register of Historic Places, I want to thank and compliment some of those who made it happen. The Alexandria Historic Preservation Commission (AHPC) has been so important leading the effort to prepare and promote the nomination. I’ve had the opportunity to work with Megan Lord, Director of the AHPC; Joe Betty Sterkx, Chair of the AHPC, and Paul Smith who has provided historic preservation consulting to the AHPC. Megan’s leadership has been so important throughout the process. Through her and the fine members of the commission, what were several neighborhoods have now been recognized and brought together as this historic district. The model that the commission followed to make this happen will be beneficial in the future to other historic areas in Alexandria. Joe Betty’s energy and enthusiasm for preservation along with her humor and congeniality have benefitted residents as we were informed through community meetings during the nomination process. As a result of Joe Betty’s urging participation from the neighborhood, Robert “Bubba” Jones along with my wife Judy and I volunteered to help in communicating between the AHPC and the residents of the neighborhood. Paul’s expertise and belief in preservation have been quite beneficial as he has informed us about the important architectural elements that are so prevalent and unique to so many homes in the district. The information he has shared about preservation tax credits creates awareness for homeowners of the benefits and opportunities to preserve our legacy. The nomination for listing on the National Register was prepared for the AHPC by Donna and Jonathan Fricker. They walked the neighborhood, analyzed records, and prepared the successful proposal. We had the opportunity to hear Donna present to the State Review Board in Baton Rouge in March, resulting in unanimous approval. It has been a great team resulting in a great achievement for this great city!